The housing market is very competitive in Severn, so you want to make sure that your home stands out when you decide to sell it. While wood and composite decks both provide a nice return on your investment, many Severn homeowners have learned that wooden decks are almost always more trouble than they are worth. Wood can splinter and rot, causing wooden decks to decay prematurely. Luckily, WOLF Composite Decks offer an alternative decking option that looks good and is durable. Let’s look at why Composite Decks are all the rage in Severn. The trees in your backyard take a beating from Mother Nature, and wooden decks suffer the same types of issues from rain, snow, heat and wind. Wooden decks can start to warp and crack, and that causes serious safety issues that could affect your family. Wooden decks are also subject to termite damage. With Composite Decks, however, you avoid all of those issues. WOLF material will not splinter or crack, and you don’t have to worry about a bug infestation causing rot. Composite Decks can hold up in any climate, and the WOLF material will be able to handle the extreme rain and snowstorms residents of Severn often face. Now, you may be thinking that you have to give up the aesthetic appeal of wood in order to have a low-maintenance decking option, but that is the farthest thing from the truth. WOLF decking offers several attractive styles that mimic the exact look of wood. Other than an occasional power washing, your Composite Deck is almost entirely maintenance free. Forget the staining, sanding, painting and preventive care you would have to put up with if you owned a wooden deck. The housing market is very competitive in Severn, so you want to make sure that your home stands out when you decide to sell it. New homebuyers don’t want to add deck building into their budget, so you protect the value of your home with WOLF decking. Instead of hearing a real estate agent tell you that you need to build a deck down the road, why not invest in a durable and attractive Composite Deck now? Freedom Fence and Home, which services the Severn area, provides deck construction for homeowners who want to improve the look, and value, of their homes. 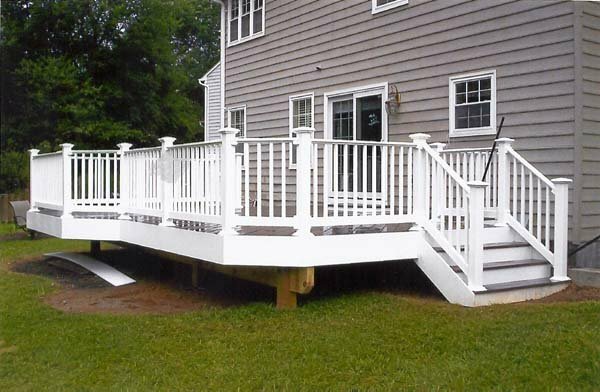 Our crews are highly trained and have been performing deck construction for years. You can view our gallery to familiarize yourself with our work. If you have any questions about WOLF Composite Decks, please contact Freedom Fence and Home by calling 443-271-6841 or visit our website. You can also follow us on Facebook and Twitter! This entry was posted on Wednesday, August 5th, 2015	at 7:01 pm	. Both comments and pings are currently closed.